1. When it comes to men who are romantically interested in you, it’s really simple. Just ignore everything they say and only pay attention to what they do. 2. Look, I’m going to find a way to be happy, and I’d really love to be happy with you, but if I can’t be happy with you, then I’ll find a way to be happy without you. 4. You may not want to hear it, but your critics are often the ones telling you they still love you and care about you, and want to make you better. 6. Kids need to know their parents love them. Their parents don’t need to be alive for that to happen. 7. But I want her to grow up knowing that I was the first man ever to fall in love with her. I’d always thought the father/daughter thing was overstated. But I can tell you, sometimes, she looks at me and I just become a puddle. 8. If she doesn’t really love you, then it’s over. And if she does love you, then love will win out. 9. If you love her, support her. 10. I’m aware that Chloe may have no memory of me at all. She’s too young. But I want her to grow up knowing that I was the first man ever to fall in love with her. 11. I love all three of my kids completely and differently. And I want them to know that I will love them for as long as they live. I will. 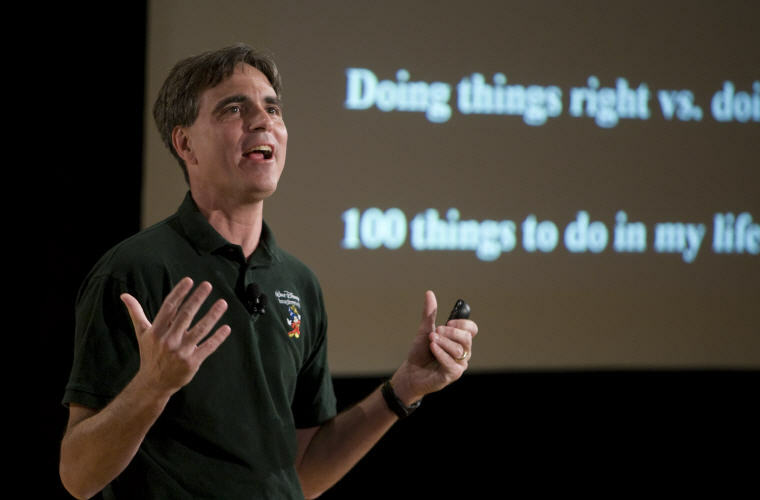 Excerpt from Wikipedia: Randolph Frederick “Randy” Pausch (October 23, 1960 – July 25, 2008) was an American professor of computer science and human-computer interaction and design at Carnegie Mellon University (CMU) in Pittsburgh, Pennsylvania. 1. We cannot change the cards we are dealt, just how we play the hand. 2. The brick walls are there for a reason. The brick walls are not there to keep us out. The brick walls are there to give us a chance to show how badly we want something. Because the brick walls are there to stop the people who don’t want it badly enough. They’re there to stop the other people. 3. Experience is what you get when you didn’t get what you wanted. And experience is often the most valuable thing you have to offer. 4. The key question to keep asking is, Are you spending your time on the right things? Because time is all you have. 5. It’s not about how to achieve your dreams. It’s about how to lead your life. If you lead your life the right way, the karma will take care of itself. The dreams will come to you. 6. Showing gratitude is one of the simplest yet most powerful things humans can do for each other. 7. No matter how bad things are, you can always make things worse. 8. Time is all you have and you may find one day that you have less than you think. 10. Luck is where preparation meets opportunity. #11 Quoting Coach James Graham. 11. When you’re screwing up and nobody says anything to you anymore, that means they’ve given up on you. 12. Wait long enough and people will surprise and impress. When you’re pissed off at someone and you’re angry at them, you just haven’t given them enough time. Just give them a little more time and they almost always will impress you. 13. Follow your passions, believe in karma, and you won’t have to chase your dreams, they will come to you. 14. A lot of people want a shortcut. I find the best shortcut is the long way, which is basically two words: work hard. 15. It’s not how hard you hit. It’s how hard you get hit … and keep moving forward. 16. Too many people go through life complaining about their problems. I’ve always believed that if you took one tenth the energy you put into complaining and applied it to solving the problem, you’d be surprised by how well things can work out. 17. Its important to have specific dreams. Dream Big. Dream without fear. 18. When we’re connected to others, we become better people. 19. The questions are always more important than the answers. 20. A good apology is like antibiotic, a bad apology is like rubbing salt in the wound. 21. Find the best in everybody. Wait long enough, and people will surprise and impress you. It might even take years, but people will show you their good side. Just keep waiting. 22. When there’s an elephant in the room introduce him. 23. Find the best in everybody … you might have to wait a long time, sometimes years, but people will show you their good side. Just keep waiting no matter how long it takes. No one is all evil. Everybody has a good side, just keep waiting, it will come out. 24. People are more important than things. 25. Complaining does not work as a strategy. We all have finite time and energy. Any time we spend whining is unlikely to help us achieve our goals. And it won’t make us happier. 26. Be good at something. It makes you valuable. Have something to bring to the table, because that will make you more welcomed. 27. Give yourself permission to dream. Fuel your kids’ dreams too. Once in a while, that might even mean letting them stay up past their bedtimes. 28. I know you’re smart. But everyone here is smart. Smart isn’t enough. The kind of people I want on my research team are those who will help everyone feel happy to be here. 29. Go out and do for others what somebody did for you. 30. My coach knew there was only one way to develop (self esteem): You give children something they can’t do, they work hard until they find they can do it, and you just keep repeating the process. 31. If I work hard enough, there will be things I can do tomorrow that I can’t do today. 32. Do not tell people how to live their lives. Just tell them stories and they will figure out how those stories apply to them. 33. The best gift an educator can give is to get someone to become self-reflective. 34. I’m dying and I’m having fun. And I’m going to keep having fun every day I have left. Because there’s no other way to play. 35. Never lose the child-like wonder. It’s just too important. It’s what drives us. 36. Apologize when you screw up and focus on other people, not on yourself. 37. We don’t beat the reaper by living longer, but by living well, and living fully — for the reaper will come for all of us. The question is: what do we do between the time we’re born and the time he shows up. 38. It is not the things we do in life that we regret on our death bed. It is the things we do not. 39. Being successful doesn’t make you manage your time well. Managing your time well makes you successful! 40. You don’t find time for important things, you make it.